Fabada Asturiana, often simply known as Fabada, is a rich Spanish bean stew, originally from and most commonly found in the autonomous community of Asturias, but widely available throughout the whole of Spain and in Spanish restaurants worldwide. Left: Fabada Asturiana, typically served with crusty bread and Asturian cider. Fabada is a heavy dish and for that reason is most commonly eaten during the largest meal of the day, lunch (normally as a starter before the 'main' course of meat). It is usually served with crusty bread, and with Asturian cider or a red wine. Fabada is made with dried large white beans (fabes de la Granja, soaked overnight before use), shoulder of pork (lacón) or bacon (tocino), black pudding (morcilla), chorizo, and often saffron. 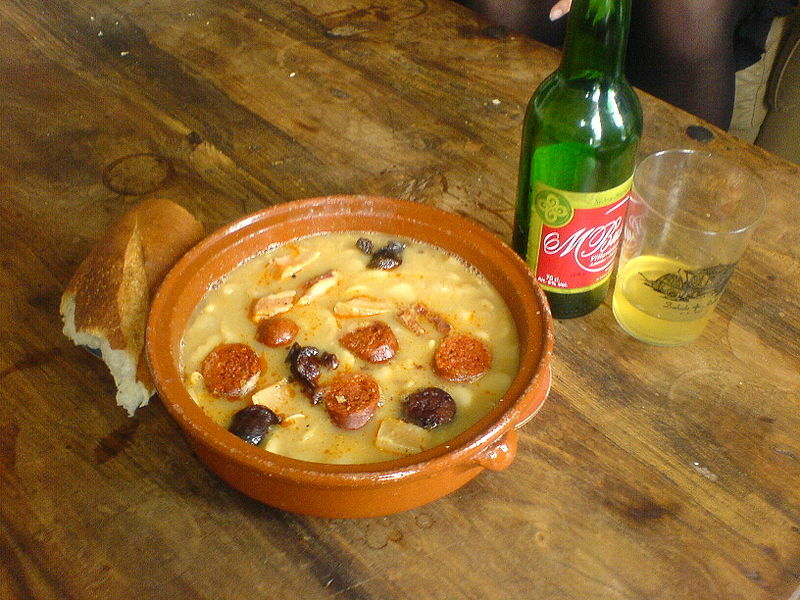 The Spanish olla podrida and southern French cassoulet, are both similar to Fabada Asturiana.